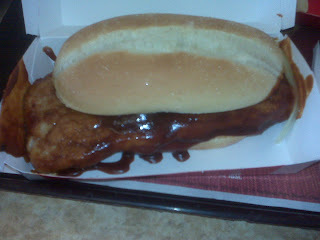 It's been a while since I've done a new installment of Nerd vs. Food, so I figured that the occasion of the McRib's re-release upon the general public would validate a post. As you know, the McRib has a cult following (much like the recently-featured Lemonade Guy, only on a slightly larger and more lucrative scale). There's even a website devoted to following McRib "sightings" across the country, and while I enjoy the occasional cult-followed processed-pork sandwich as much as anyone, I'm not going more than 10 minutes out of my way to buy one. But I digress. After a surprisingly short wait in line, given the volatile combination McDonald's has crafted of McRib availability AND the Monopoly game, I had a McRib value meal in hand within moments. It was a welcome trend for this particular McDonald's, which tends to take your order, lay the receipt on the counter, and pretty much forget about you until someone feels the urge to clear out the backlog of customers by actually giving them the food they already paid for. However, today's not the time to complain about standing in line as apathetic teens twiddle their thumbs while you're waiting for fast food. 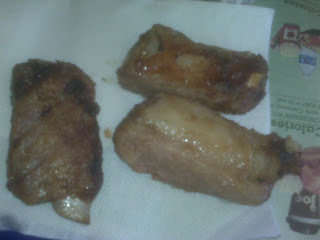 There's a McRib to be eaten. Shortly after opening my Monopoly pieces (sadly, I didn't win a million dollars...yet), I cracked open the McRib like a finely aged bottle of Cristal, or whatever the expensive, cool drink is these days. Traditionalists will be glad to know that nothing has changed: the "meat" (note the use of quotes), bun, sauce, onions, and pickles are all the same as they ever were. You could have rolled the clock back to 1981, or 1992, or 2001, and the sandwich would've tasted exactly like it did today. For all I know, that could be a literal statement based on the preservatives I just ingested. Long story short, the McRib is already in midseason form, the fast-food equivalent of an attention-grabbing veteran who decided to come back for one more year after leaving us wondering about their future. Let's just hope it steers clear of Jenn Sterger. If you were on the fence about purchasing one of these mystery-meat sandwiches, I enthusiastically urge you to go for it. Remember: You only live once, and that life probably gets shorter with every McRib you put down. Regardless, I say to try one anyway. I'd give a celebrity endorsement from someone I just saw eating one if I could, but the closest I could find was some guy who looked like Vint from Mama's Family standing in line, and he probably wouldn't have gotten the joke. Impossible Scott...he was at the Duquesne McDonalds by Kennywood. 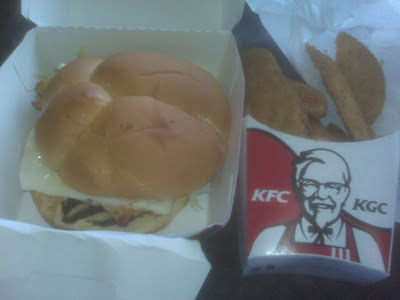 And I clicked to enlarge the picture of that sandwich...I may have threw up in my mouth a little. Geeeeze-us, people eat that and love it? I took the tip, and I'm in bbq-sauce-infused pork happiness. It may look unpleasant to some, but, don't forget, chocolate mousse looks like crap in a photo.